Monks will be putting their treasure up for auction to support the work of their Monastery. Around 200 lots, which have been given or discovered by the monks at The Community of the Resurrection in Mirfield, will be available to bid on in the auction which takes place next April. For the last three years the monks have auctioned historic items to pay for the refurbishment of the community’s church, which had fallen into disrepair in 2008. 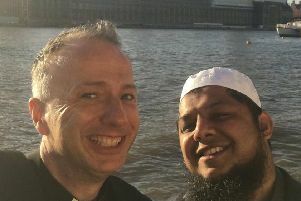 But this year, the event, at the Monastery on Stocks Bank Road will raise money to aid the community in its missions including social care work, training ordinands for priesthood and offering spiritual retreats. Among the items which will go under the hammer is a piscina water fountain, an architectural feature removed during the recent church renovation. Others include a 19th century Maurice Levy oil painting on canvas, an ivory crucifix and Roman coins. Fr John Gribben, who is organising the event, said many of the items were “interesting and antique” and thanked those who had given so far. The Community of the Resurrection was founded in Oxford in 1892. But six years later the community moved to Mirfield and the town became the centre of its activities. It is home to the College of the Resurrection, a retreat house and the Church of the Resurrection, which was completed in 1938. The auction takes place on April 9 in the community’s college refectory. Anyone who wants to donate items can contact FR Gribben on 01924 483339.